When Peer Review Week was launched in 2015 with the goal of honoring and celebrating peer review, it soon became clear the idea had struck a chord with researchers around the world. Fast forward to 2016 and this year’s event focuses on Recognition for Review, exploring how those participating in review activity – in publishing, grant review, conference submissions, promotion and tenure, and more – should be recognized for their contribution. Planned virtual and in-person events include webinars, videos, interviews and social media activities designed to improve understanding of the principle of peer review and how it is practiced within the scholarly community. A full list of events is available on the Peer Review Week website, which also features a list of online resources to advance our understanding of peer review and its role in 21st century scholarship. Keep visiting the website throughout the week to view new items as they are added. You can also follow the week’s highlights on Twitter - #PeerRevWk16 and #RecognizeReview. Too late to register? Don't worry, the archived version of this webinar will be available at this url soon. What do researchers think about the peer-review process? 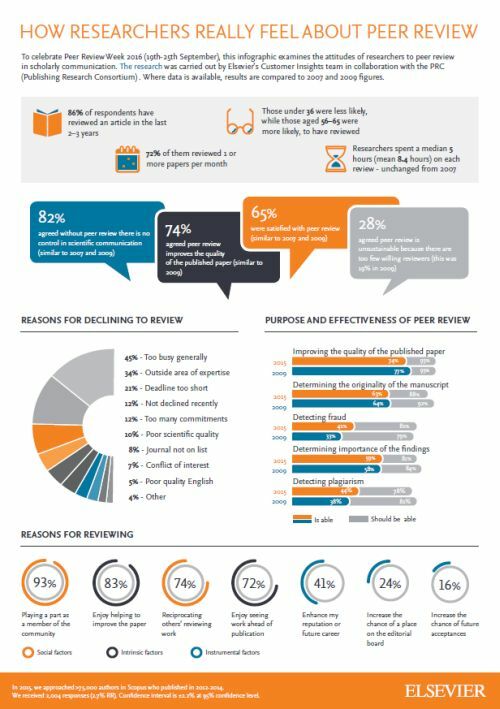 Elsevier’s Customer Insights team partnered with PRC (Publishing Research Consortium) to ask researchers how they really feel about the peer-review process. Below is an infographic capturing some of the key findings. The full results are also available to download.